Trickling in through the giant radio dishes of NASA's Deep Space Network, faint whispers from a distant robotic explorer deliver a message: I may not have much time left. It is Voyager 1, our most distant explorer, still functioning and communicating with NASA as it speeds ever farther into deep space. The message is not a literal S.O.S. signal, but data from Voyager's engine system alerting NASA engineers that a problem is on the horizon: Voyager may soon lose the ability to align its radio dish -- its communication lifeline -- with Earth. Loss of contact with Voyager would spell the end of a more than 40-year career of discovery, an odyssey that began with the exploration of Jupiter and Saturn and continued in a long-distance quest to find the very edge of interstellar space. Decades ago the "grand tour" of Voyagers 1 and 2 brought us remarkable images and discoveries from Jupiter, Saturn, Uranus, Neptune and their moons. They revealed active volcanoes on Io, hinted at a huge liquid-water ocean under Europa's ice crust, and piqued our curiosity for Saturn's mysterious, cloud-shrouded Titan. They showed us stunning pictures of Jupiter's cloud belts and huge storm systems, and opened our eyes to exquisite details of Saturn's rings. After traveling more than 13 billion miles, Voyager 1 has only recently crossed that threshold beyond the reach of our sun and entered interstellar space. With a vast, unexplored realm laid out ahead, an untimely end to Voyager's mission now would be a tremendous loss. Scientists are hungry to learn more about what lies between the stars of our galaxy. It was inevitable that at some point, Voyager 1's ability to keep in touch would start to fade. Operating such a remote space observatory presents several technical challenges, not the least of which is maintaining radio communications over great distance. NASA does this by keeping Voyager's main radio dish aligned with Earth and the giant radio dishes of NASA's Deep Space Network. Left to its own inertia, the spacecraft would slowly rotate out of alignment, reacting to the subtle but persistent forces of things like pressure from sunlight and the solar wind. To date, Voyager 1 has used a set of "attitude control thrusters" that fire in tiny bursts to subtly steer the spacecraft to maintain alignment. But over the last few years, NASA has noticed that these thrusters are degrading, producing less and less thrust and requiring longer bursts to do their job. You don't keep driving your car when the engine begins to sputter, if you plan to keep driving it. You take it to a mechanic. Since bringing Voyager in for a tune-up isn't an option, NASA engineers had to imagine how to sustain Voyager's mission health using on-board resources. Remember that scene from Apollo 13 when the engineers had to figure out a way for the astronauts to fix the carbon dioxide removal system using plastic bags and duct tape? The workaround for Voyager 1 was to attempt to reenlist a different set of engines that had been shut down for 37 years. These are Voyager's "trajectory correction maneuver (TCM) thrusters." They hadn't been tested since NASA engineers last used them to help Voyager 1 maneuver through the Saturn system to make close flybys of the planet and its large moon, Titan. Once the Saturn flyby was over, the TCM thrusters were no longer needed, and were shut down. 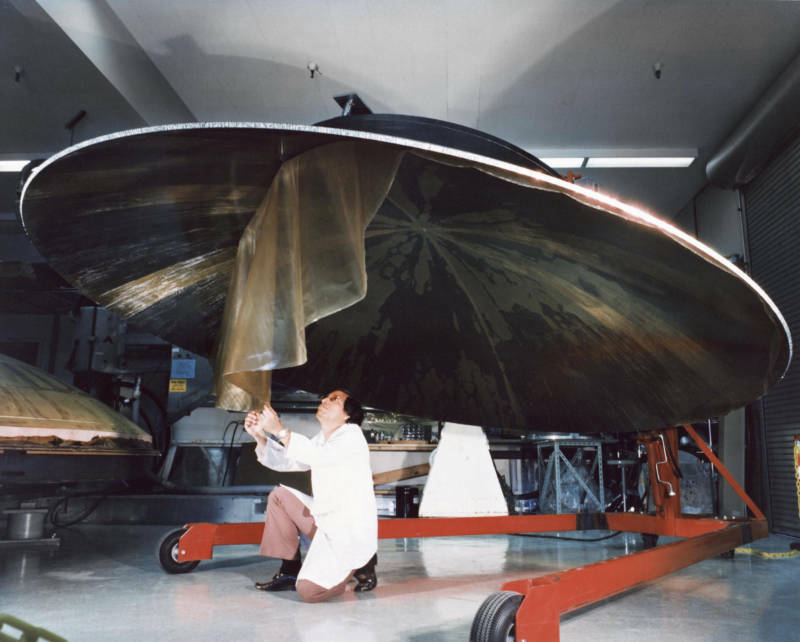 On November 28, 2017, NASA sent the command to Voyager to test-fire the TCM thrusters. That radio signal travelled through space for 19.5 hours to reach Voyager (that's now far away it is), while NASA engineers waited. Then, after another 19.5 hours of silence, NASA's Goldstone radio antenna in the Mojave Desert received word from Voyager 1 that the thrusters had fired! NASA now has a path forward to keep Voyager 1's communication dish facing Earth for at least another two or three years, by switching to the TCM system once the current thrusters have gone off-line. Launched in 1977, Voyager 1's primary mission was to make flybys of the Jupiter and Saturn systems before being flung by Saturn's gravity onto a course that would take it out of the solar system, bound for interstellar space. Now, Voyager 1 is the most distant human-made object from Earth, and has been since it overtook the venerable Pioneer 10 in 1998. 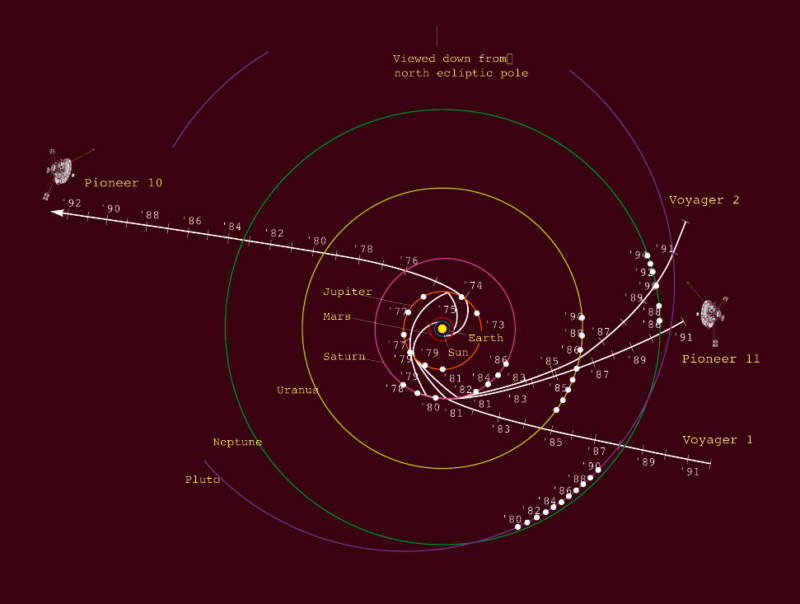 As of March 2018, Voyager 1 is over 13 billion miles away—or 141 times farther from the sun than Earth is. Voyager 2, now over 10 billion miles out, followed a different path from its twin, cruising on to Uranus and then Neptune after visiting Jupiter and Saturn. Voyager 2 became the only spacecraft to visit all four gas giant planets, and the only one ever to visit Uranus or Neptune. 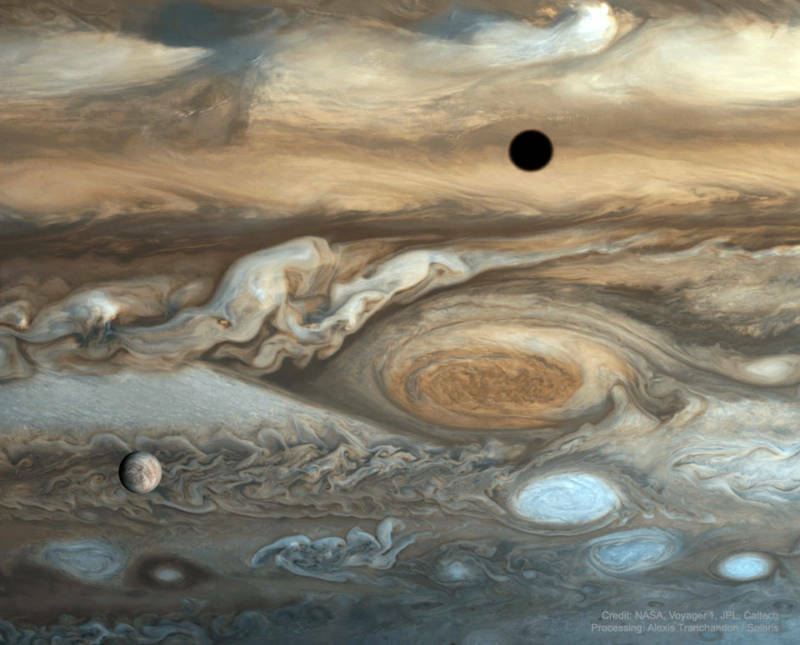 After departing the realm of the gas giants, both Voyagers became de facto envoys to interstellar space, having achieved solar escape velocity during their planetary flybys. 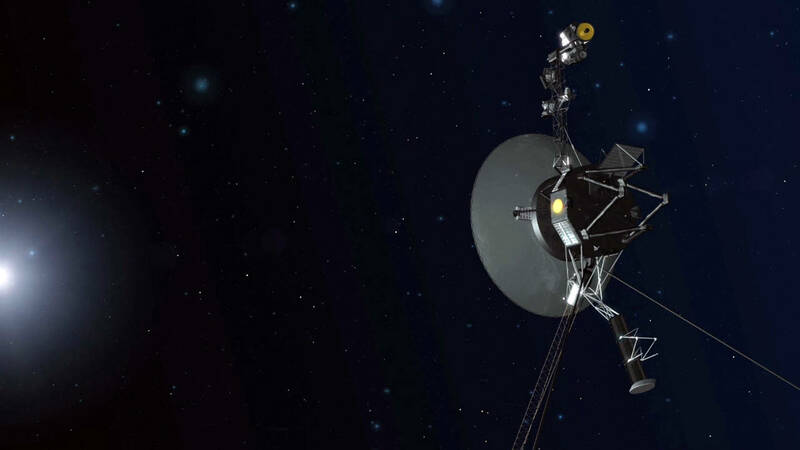 From that point on, the Voyagers' mission switched from being planetary explorers to becoming remote outposts measuring properties of the space around them—the speed and direction of the solar wind and associated magnetic fields, the activity of electrically charged particles flying by. Think of the Voyagers as extremely remote weather stations, reporting back the "space weather" conditions as they coast to ever greater distances. For many years, Voyager mission scientists studied the trickle of data beamed back from both spacecraft, waiting for the day when one or both might report a change in the particle or magnetic environment—a "shift in the wind" indicating a probe had entered interstellar space. In August 2012, Voyager 1 officially crossed over, detecting a large increase in charged particles coming from interstellar space—particles that are normally deflected by the solar wind. The difference between interstellar space and the bubble of solar wind surrounding the sun is subtle, and you wouldn't notice a change with any human senses. In fact, in either case, human senses would report only empty space. But with its sensitive particle and magnetic field detectors, Voyager 1 is giving us our first taste of what lies between the stars. The longer it stays in communication with us, the deeper into the galaxy we will probe.